Ipswich folks have always had a taste for good rum. All we know of Benjamin Wheeler who lived at 67 Turkey Shore Road is that in 1750 was that he was fined for selling rum without a license. When Rev. David Kimball was hired as pastor in 1806 for the First Church, his payment included “Best West India Rum” calculated at $ .84 per gallon. 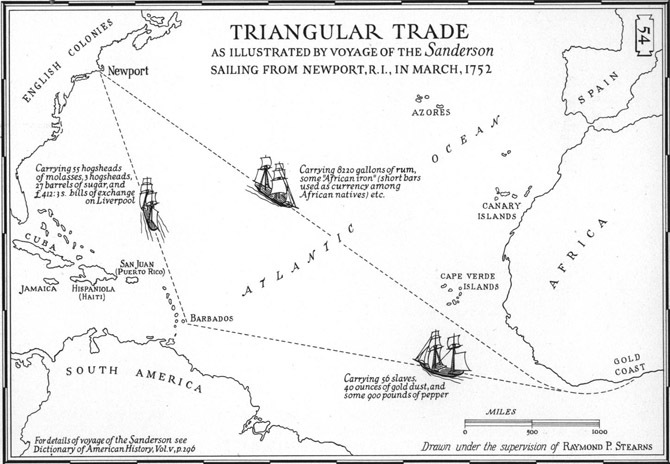 Rum was an element in the “Triangular Trade ” that brought slaves to America. The story of rum in Colonial America is also the story of slavery, the second leg of the “Triangular Trade.” Joseph Felt wrote that in 1755 there were sixty two slaves in Ipswich above the age of sixteen. Slavery was abolished in Massachusetts in 1780, and I know of no record of slavery in the Heard household. John Heard’s son Augustine Heard (1785-1868) owned Augustine Heard & Company, which was involved in the China opium trade, and became the third largest American firm in China in the mid-nineteenth century. In 1919, the Eighteenth Amendment of the United States Constitution established the prohibition of alcoholic beverages in the United States A separate National Prohibition Act, known informally as the Volstead Act, was enacted to carry out the intent of the law. The Anti-Saloon League drafted the bill, which was named for Andrew Volstead, Chairman of the House Judiciary Committee. This ad appeared in local papers throughout the country in March, 1918. Harold Bowen wrote in Tales of Olde Ipswich that lobstermen would place an order for liquor in their traps and the orders would be filled in the morning. One Ipswich fellow being chased by the Coast Guard ran aground in the marsh, and escaped by swimming to Treadwell’s Island. His boat was set on fire by the Coast Guard or himself, we’re not sure),and burlap bags full of rum were thrown overboard. The next morning at the break of dawn, Ipswich clammers pulled the bottles out with their rakes, but not many of them worked the rest of the day. On January, 17 1920, the Ipswich Chronicle published a small notice on the front page. A new law would be enforced by the Chief of Police; Prohibition was in. 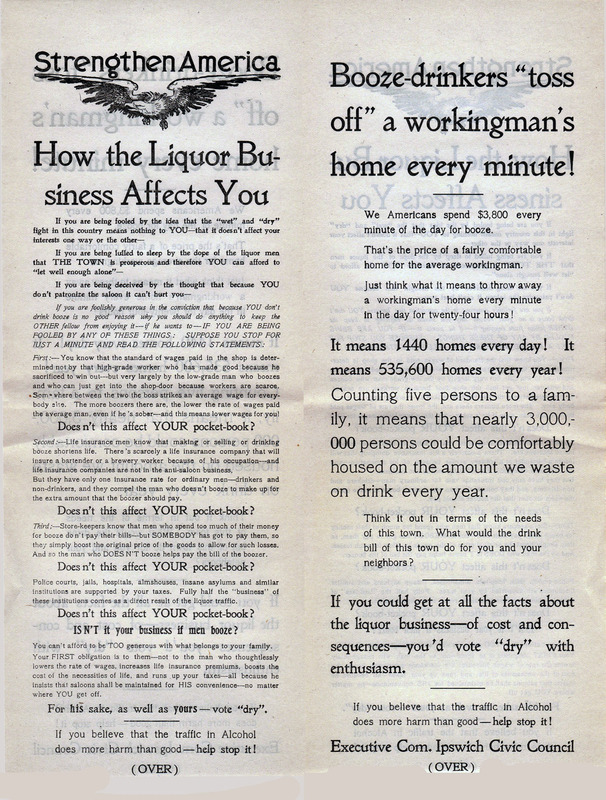 This new law, known as the Volstead Act, was promoted largely by the temperance leagues, in an effort to stop marketing of liquor from salon trade and other public consumption. The manufacture, sale and transportation of intoxicating beverages was prohibited. But that didn’t stop a few daring Ipswich men, out to make an extra buck. Ipswich, with its beaches, wharfs and hidden creeks was a paradise for the rum runners and bootleggers. Rum runners used to pick up their contraband from the many alcohol-laden steamers and schooners anchored on Rum Row. This was an area that stretched from a point of 12 miles southeast of Thatcher’s light to 12 miles north of Cape Cod, always anchoring beyond this country’s jurisdiction. At least 17 such large vessels were known to bring in the illegal liquor, coming from such places as Britain and Nova Scotia. Smaller boats would come from shore, load the liquor on board, then attempt to take it back to land without the law catching them. The shores of Ipswich and Rowley were great territory for the rum-runners. And, it wasn’t just rum they were running! Some of the best gin, champagne and plenty of rot gut whiskey arrived in the wee hours of the morning. My mother remembered the activity that went on after dark. Rum-running always took place on the dark of the moon. It was very seldom that one could be caught. The location had to be a local place and a local fisherman who knew the waters. Of course they knew the navigation by just cruising along the dark shores–they could tell by the sound of the surf. They never came in with any lights. “Rum Row” it was called outside the three-mile limit. There would be fleets of boats out there sometimes for three weeks, anchored until they could unload their cargo of liquor. Speed boats would go out from shore and contact the boats, which would load these small boats. Usually it would be local people, and even sometimes law enforcement owners. These large boats were owned mostly by syndicates, principally by big racketeers. It was all attached to big money. 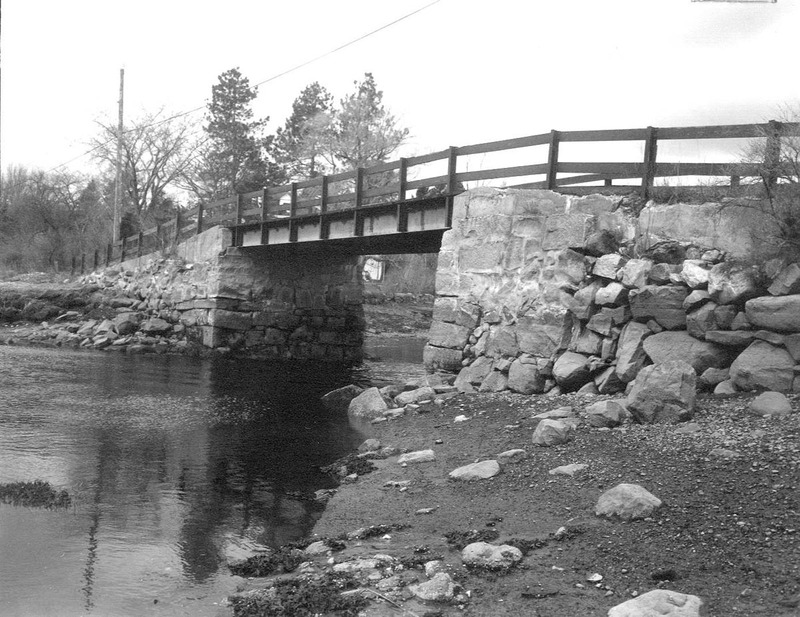 A frequent unloading place was the bridge at Labor in Vain Road, known then as Gould’s Bridge. Ten departments were set up by the U.S. Government to enforce the Volstead Act. Revenue agents were sent out to combat this situation, supported by the local police and the Coast Guard.The boats built for the rum runners were very special. They may have had 300-gallon tanks, with big engines, probably 100 horsepower. The Coast Guard couldn’t catch these fast boats, but liked to seize one whenever possible and convert it into a Coast Guard boat. Even today, people are reluctant to discuss the rum runners by name. An Ipswich river man knew a fellow from town who built boats for the rum runners. 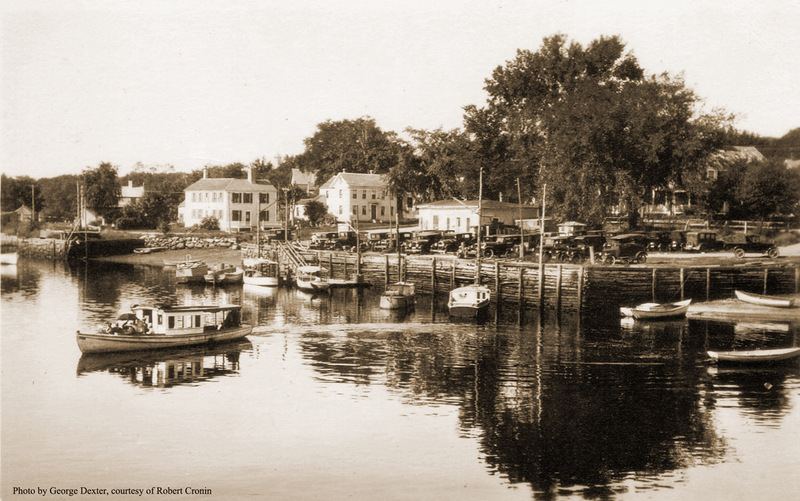 Tales of the Coast Guard chasing rum runners are common among the people who lived along the Ipswich river during this era. Residents on East Street, Labor-in Vain and the Neck area would awaken to the eerie sounds of the trucks and activity going on all night. The residents knew what to expect, and eventually fell back to sleep.The old Ipswich residents can tell you many tales such as, making their own little “spirits” in their bathtub, long after dark! The Coast Guard raided Johnny Post’s place on Grape Island, finding some contraband. Another 100 gallons was stashed in Pine Creek. On September 23, 1927, the Chronicle reported a raid on Bull Brook Farm. 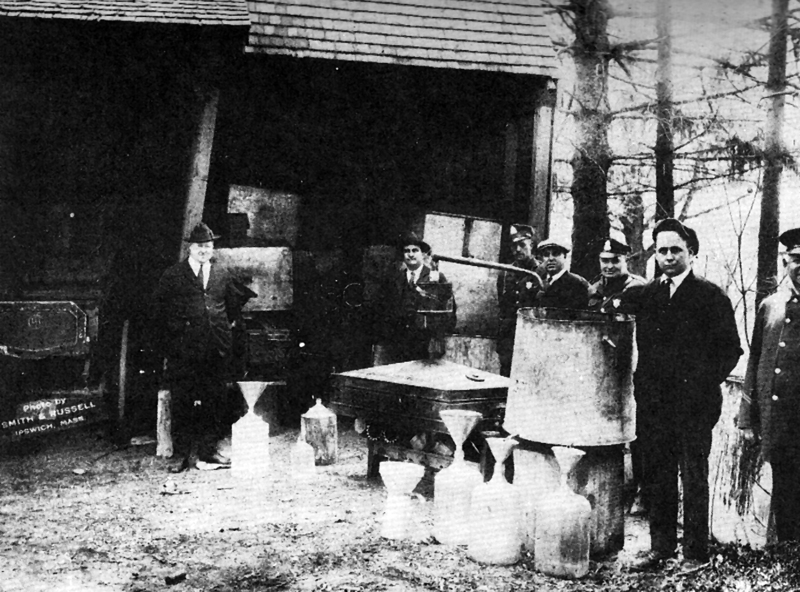 A 150 gallon still, 50 gallons of distilled spirits, and 1,7000 gallons of mash were found. There is also the tale of the hearse that hit a pole and thereby disclosed that its contents leaked. An episode everyone knew about occurred on June 25, 1930. The Rum Runner, a large vessel carrying a $175,000 cargo, ran aground on Treadwell Island. Unloading the contents in a nearby shack, in the marshes, and buried neck-down in the sands, the contrabanders then set the ship afire, escaping the island.The blaze attracted clammers and townspeople alike, who busied themselves searching for the hidden booze. The Ipswich police recovered only 87 cases of Scotch, and 290 quarts of champagne, estimating the hauls value of $65,000. The story is still told of two soused clammers sitting on Crane Beach, each with a quart of champagne. One clammer said to the other, “God, this beer is flat.” The rum runners usually traveled by night, up little creeks and inlets. They would go out to get the booze around two or three o’clock in the after-noon, returning at dark on a high tide. The booze was unloaded at convenient places like Gould’s Bridge. To distract the authorities, during these times someone would set a fire in town. 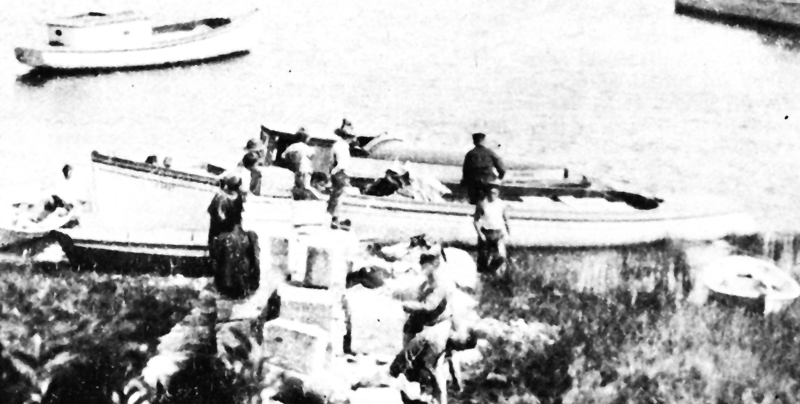 Harold Bowen shared this photo of rum-runners being caught at Fox Creek, carrying a thousand gallons of Belgium alcohol. Some grand public gestures of apprehending the rum runners were made, but many were skeptical of the incorruptibility of the local law enforcers. The antipathy for Prohibition made its repeal inevitable. Thirteen years after adoption, President Roosevelt signed a proclamation declaring the end of Prohibition. The people who ran rum weren’t the big-city gangster types, just folks like you and me. Looking back on the law, Prohibition seems to have been quite senseless, giving some the opportunity to make extra money illegally. Any trade or money-making brings its problems. Hijacking even got to be a problem. The economy was slow and people were riding out the depression. As long as the bootleggers stayed outside the limits, they were under international laws. Not even the coast guard could touch them. At times the boats would come in and unload quickly before anyone caught on. Lobstermen would place an order for liquor in their lobster traps during the night and the orders would be filled with boot-leg booze in the morning. It was impossible for the coast guard to keep up.The only way to catch them was by knowing their code. The larger boats would send a code by wire. The code had a mixed alphabet like, F.O.B. : rye; F.E.L:scotch, E.E.M.-rum; Berries:come as soon as possible; Plums:stay outside the limits; and Peaches: conditions are “hot here!”…I bet they were !!!!! !